John Lewis Krimmel, attributed to. Nightlife in Philadelphia—an Oyster Barrow in Front of the Chestnut Street Theatre, circa 1811-13. Watercolor, 23.3 by 17.3 cm. In this modestly sized scene, the artist has captured the effect of a fleeting, mundane incident with a convincing effect of candor. Gathered around a wheelbarrow full of oysters, three passersby enjoy a nighttime snack. The concession is run by a black man attentively stationed beside the barrow. He wears attire reflecting the fashionable urban center of early-19th-century Philadelphia. A young white woman wearing a blue gingham dress with a crimped collar is positioned just in front of the barrow. Shelves on one end contain a portable lamp, utensils and condiments to enhance the flavor of the oysters. She holds up a candle to better illuminate two young men while she extends an empty plate toward the black man. The man closer to the viewer looks at the woman as he points a finger at the oysters in the barrow. She, instead, seems to be enjoying a dalliance with the other young man, who holds his finger up to his face. In the background stands the imposing facade of the Chestnut Street Theatre. Largely redesigned by the English-born architect Benjamin Henry Latrobe in 1804, the stylish late-Georgian building immediately became one of the major architectural landmarks of post-Revolutionary Philadelphia, a position underscored by its placement diagonally opposite Independence Hall. The theater hosted the most fashionable plays of the period, many written and performed by leading figures of the English stage. This typical scene of life on the streets of Philadelphia belongs to a series of watercolor views attributed to John Lewis Krimmel, a German-born artist who arrived in the city in 1809. Krimmel is generally recognized as America’s first significant painter of genre, or scenes of ordinary life. With only rudimentary training as a portrait painter, he soon turned to the urban landscape for his inspiration. Most of Krimmel’s watercolors depict Philadelphia urban life in a vein similar to the oyster vendor’s activity. All are observed within the city center between Independence Hall and Penn’s Landing on the Delaware River. At least two other scenes depict the interaction between working-class blacks and middle-class whites strolling around the city at their leisure. The views take place before prominent Philadelphia institutions, producing the effect of an itinerary of the city’s architectural highlights viewed through the scrim of everyday life. One represents a well-dressed white couple casually striking up a conversation with black chimney sweeps across from Christ Church. Another, set before the First Bank of Philadelphia, shows several black men engaged in sawing wood. The relationship between the black man and the smiling young woman requires further clarification. Though usually identified as a patron, she most likely serves as a vendor herself, acting as an intermediary between the patrons and the black owner of the barrow. Her presence may also be intended as a further inducement for the gentlemen to tarry for a while. Lying behind this mobile street enterprise are the many fixed establishments run by black entrepreneurs in the vicinity. Besides oyster cellars, businessmen of color offered many other forms of entertainment and refreshment. 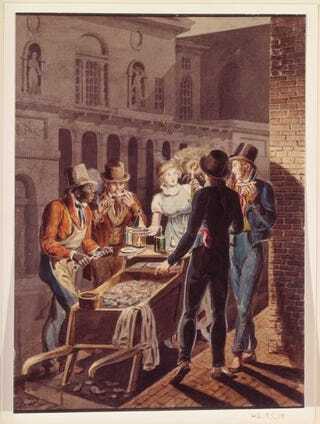 Gambling establishments, saloons and dance halls served the baser needs of a racially mixed patronage, representing a social and ethnic porosity otherwise not commonly found in the city. The relationship suggested here between the black oyster vendor and the young white woman may further demonstrate this general sphere of interaction, in this case one defined by shared economic opportunity. To Krimmel’s observant eye, new to the nation’s shores, the intricate panoply of city life must have appeared seamless in its variety and intrinsic value. On the other hand, native-born artists tended to represent African Americans with a level of disdain that soon descended into gross caricatural distortion. Krimmel’s engaging watercolor views of the black population of Philadelphia focus instead on the entrepreneurial spirit of the poorer classes. Krimmel’s other watercolors of black Philadelphians at work similarly involve points of itinerant service around the city center. Far from serving as merely picturesque foils for the structures behind them, these figures represent a very real part of black life in the city during an extremely important period in its history. In the census of 1810, the approximate date of the watercolors, free black citizens made up nearly 10 percent of the entire population of the city, the greatest share they would reach during the 19th century. The large number of black people moving to the urban area during this period were caused by several forces, most related in one way or another to the demise of slavery. By the terms of the act that abolished the institution in Pennsylvania in 1780, blacks born on or after that date would become free at the age of 28. For many, freedom came as early as 1808, just before Krimmel painted his watercolor views of the city. However fleeting, the positive interaction between the races around the barrow stands in stark opposition to the white majority’s resistance to the more significant participation of blacks in the city’s labor force. As free African Americans began to arrive in Philadelphia and other cities farther north, they experienced the advent of a more overt form of racism still recognizable today. Whites refused to work alongside blacks in the skilled trades and along the docks. Friction between the two populations ultimately erupted into outright violence. Fearing for the loss of their jobs, whites often fomented riots in black neighborhoods. Though many of these new citizens continued to live in economically straitened circumstances, opportunities for advancement did still exist. An emerging black middle class firmly established itself in the city, flourishing as nowhere else in the young nation. James Forten had begun working as a chimney sweep like those depicted in Krimmel’s scene near Christ Church. By the time this watercolor was made, however, Forten owned the most lucrative sail-making establishment in the city. He soon became one of the richest and most civically prominent men in Philadelphia, regardless of race. Painted a full 200 years ago, Krimmel’s positive, matter-of-fact views of blacks in Philadelphia record a vital part of the city’s life at a time when aspirations for lofty success not only ran high but also were often achieved. The first real taste of freedom gained by blacks in the early years of the republic proved to be a wellspring for the continuing struggle for their rightful place in a city that they had worked so hard to build.